The review of tuition fees in England will have to wait until a decision is taken on whether tens of billions of pounds of student loans should appear in the government's deficit figures. The review of post-18 education funding was commissioned by the prime minister after worries about excessive fees and interest rates. But the Department for Education has confirmed it will not report back until a ruling from the Office for National Statistics (ONS) - which could re-write the public cost of student finance. 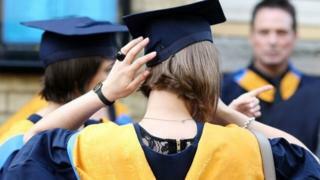 The ONS is expected to publish in December how student loans should appear in public finances. And the review into fees will now have to take into account its findings and report back to the government in the new year, with the government to announce its decision some time afterwards. What began as a question of how the public accounts are reported has now become a decision that could cause a re-think over the affordability of the system of student fees and loans. It follows warnings from committees in both the Commons and the Lords that the current arrangement, in which student loans do not affect the deficit, is a "fiscal illusion". At present student loans, with £118bn currently outstanding, will not be recorded as a cost until after 30 years, when unpaid debts are written off - even though the Office for Budget Responsibility has suggested that up to 60% of borrowing might not be repaid. By the end of the year, the ONS will decide whether this is flawed and whether the cost of student finance should be added to the deficit. This would make the student loan system a pressure on current public accounts, rather than something deferred to the future. If such a change is made, the government would then see tens of billions of fees and loans becoming a negative in the public finances - which could raise questions about the public cost of student borrowing and the viability of such high levels of fees and loans. The House of Lords economic affairs committee published a hard-hitting report in the summer saying that the current arrangements were concealing the real cost of the fee system. Last week the committee chairman, Lord Forsyth, wrote to the Education Secretary Damian Hinds accusing his department of failing to provide an adequate response. "We concluded that recent changes to higher education financing have been motivated mainly by the desire to lower the deficit," wrote Lord Forsyth, a former Conservative minister. The letter also asked for an answer to his committee's finding that: "The high rate of interest on student loans creates the illusion that the government borrowing is lower than it actually is." The committee, with three former chancellors, had argued that the cost of fees needed to be made apparent if an informed decision was going to made on university funding. The House of Commons treasury select committee also warned that the current reporting arrangements meant "there is no effective control over the increasing fiscal cost of the student loan regime". A Department for Education spokeswoman said: "The government's review of post-18 education and funding will report in early 2019 - as set out in its terms of reference. "The report from the independent panel chaired by Philip Augar will be published at an interim stage, before the Government concludes the overall review. This is not expected to be before the end of the year."